This page shows amazing graphic photos of hypnotherapy students applying clinical hypnosis pain control methods. During the 7th and 8th week of the training we teach various medical hypnosis methods including pain erasure. These photos and student comments are from that section of the course. Participation in the needle exercise is totally voluntary. 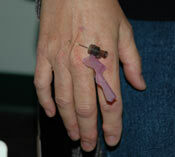 If you are not comfortable with seeing photos of needles click here. 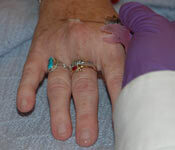 Of the 34 students taking the Accelerated Healing and Pain Control module for their Medical Support Clinical Hypnotherapy certification, 16 volunteered to have Dr. Robert Sapien insert a needle through the top of their hand after their classmate induced trance and employed the pain control methods. Staff hypnotherapy coach and licensed physician, Dr. Robert Sapien, did all the needle insertion work. Prior to taking this course, some of the students who participated had fears and even phobic responses to needles and the sight of blood. During our training they healed those fears and then went so far as to volunteer to participate in this exercise. This deepened their personal confidence in their mind power and afterward they all agreed they could better help future clients in need of medical hypnosis. During this pain control session Nate is induced into hypnosis by his fellow student Dennis Plummer. Dennis guides Nate through a process of numbing his hand to create hypnotic pain control. 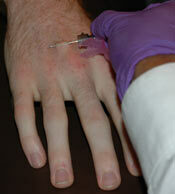 Nate is then ready for Dr. Sapien to insert a needle through the top of his hand. Dr. Sapien lifts the needle without Nate feeling any pain. Nate is then instructed to open his eyes to see the needle through his hand. In the first photo we see student Kent Tompkins has hypnotized Nikki and she is ready for Dr. Sapien to insert the needle. Click here to download class schedules, tuition options and catalog or, call us toll free in the US at 877.983.1515 and international calls at 505.983.1515 to speak with an admissions coordinator. 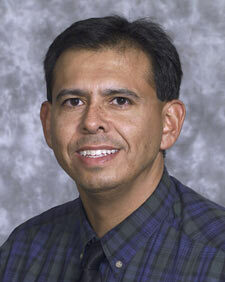 Robert Sapien, MD, CMS-CHt is on staff as a practical skills coach and medical hypnosis specialist. He uses the techniques he learned here at the Academy during every shift in the UNM emergency room where he is Director of Emergency Pediatric Medicine. You won’t find this kind of confidence building at any other hypnotherapy school.